Named after the distinctive hump in front of their small dorsal fin, humpback whales often feed in large groups and are famous for their singing ability. Humpbacks are mainly black or grey with white undersides to their flukes, flippers and bellies. They are 15m long. One of the most noticeable characteristics of humpback whales is their long flippers. Humpback whales are extremely active, often slapping their flippers and flukes on the surface of the sea. They also breach more than any other baleen whales. Humpbacks often feed in large groups and are famous for their "song." Male humpbacks produce a long series of calls that are normally heard during the winter breeding season, although songs have been recorded in the summer. The whales may repeat the same song for several hours. Humpback songs appear to be shared by all singing members in the same area of the ocean: as the song changes, all members sing the new song. The same song is sung in spite of the great distance between groups in the population (up to 5000km). This sharing of songs may occur when groups intermingle during migration or in shared summer feeding grounds. Researchers are not certain why humpback whales sing. They have hypothesised that the songs attract females or are used as territorial markers. In the northern hemisphere, humpback whales are found in the north Pacific, from South-East Alaska, Prince William Sound, and British Columbia and migrate seasonally to Hawaii, the Gulf of California, Mexico and Costa Rica. 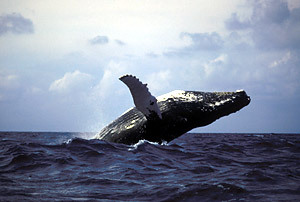 Humpbacks from the Western Aleutians and Bering Sea migrate to the northern Marianas, Taiwan (China), Japan, the Philippines and Korea. 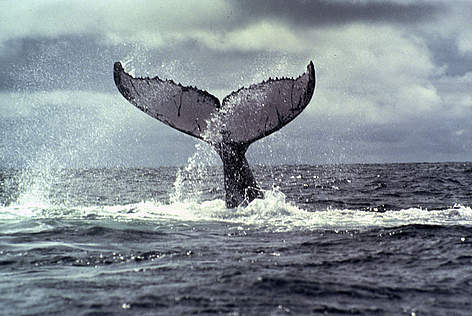 In the North-West Atlantic, humpbacks are found in summer feeding areas off Iceland, southern Greenland, Norway, Svalbard and the eastern seaboard of Canada and the United States. This population migrates south to the Caribbean and south from the southern Bahamas to Grenada, the Grenadines and Venezuela. Humpbacks are baleen whales, which means they filter their food through baleen plates. They strain krill, anchovies, cod, sardines, mackerel, capelin, and other schooling fish from the waters. Some humpbacks have been observed creating "bubble nets" to catch their prey. 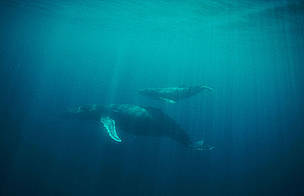 The whales dive deep then swim up in a spiral pattern, while releasing a steady stream of bubbles from their blow holes. As the bubbles rise they form a "net" that surrounds the whales' prey. The whales swim up through the centre of the bubble net and feed on the prey trapped inside. Humpback whales have complicated courtship behaviours. Often, many males will surround a single female hitting each other in a competition to get close to her. Females become pregnant about every two to four years, and are pregnant with each calf for about 11 to 12 months. The calves can grow 0.5 metres per month while nursing on their mother"s rich milk. Females nurse their newborn calves in warm, shallow water. Because of an absence of teeth (which can be used to estimate age in other mammals), it is difficult to tell the age of a humpback whale but they are believed to live to 80. As recently as 1988, humpback whales were listed as endangered by IUCN. Populations have now recovered, due to the introduction of commerical whaling bans. There are still concerns about apparently discrete and small subpopulations of humpback whales, including those in the Arabian Sea, the western North Pacific, the west coast of Africa, and the South Pacific subpopulations in portions of Oceania. Humans hunted humpback whales commercially for oil, meat, and baleen from the 17th to early 20th centuries. Humpback whales are still hunted in Greenland and by the Bequians of St Vincent and The Grenadines, for subsistence purposes, but only 1-2 per year are caught. Plans to resume hunting for humpback whales by Japan may have a more damaging impact. Like other large whales, humpbacks may be harmed by pollution, ship strikes, and entanglement in fishing gear. Offshore oil and gas development is also a clear threat.